The competition offers a stimulating challenge and supports the curriculum of civil and structural engineering departments of UK universities. The competition operates on two levels. Submissions are first judged at each university by the academic tutor(s) and the winning submission is then entered for the national level of the competition by the tutor. Only one entry from each university can go forward for final judging at a national level. Design calculations for the selected scheme superstructure. Drawings of the selected scheme superstructure. This provides an opportunity to prepare elements of interest to prospective employers, some of whom are involved in setting and judging the competition. Structural Concrete is open only to students studying for a degree at a UK university. Entries can be single, joint, or from teams of up to four students. The competition brief can easily be incorporated into existing university curricula and taught over the first, second or both terms. Register interest: University academic tutor(s) should register the university’s intention to participate by email to info@concretecentre.com. Download an entry form: An entry form is included in the competition brief or the entry form can be downloaded separately. Submit entry form: The details of the local winner and the completed entry form for the national competition must reach The Concrete Centre by Friday 14 June 2019. 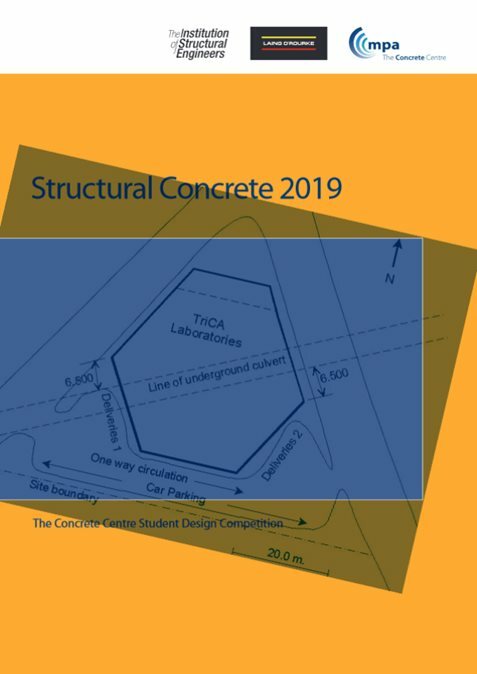 Submit competition entry: The physical submission must reach The Concrete Centre by Friday 12 July 2019.